Banners/Signage - Breakthrough Marketing, Inc.
We focus on durability, both with the stand mechanism and the synthetic polyester material we print on (with liquid laminate). We’ve seen stands with plastic parts crack and then they look bad or don’t even work properly. We’ve seen others with just really silly mistakes: attaching the banner at the top becomes hard or hazardous because of how they hook, or perhaps the way the pole sits in the bottom just isn’t very sturdy. We’ve seen laminates start to peel off the edges of prints. We’ve seen prints that easily crease. These things are not noticeable or even thought about until they start to affect you as a customer. Then you wish you had “just gone with that other guy that promised all the stuff about durability and backed it up with their guarantee/warranty.” That other guy is us. 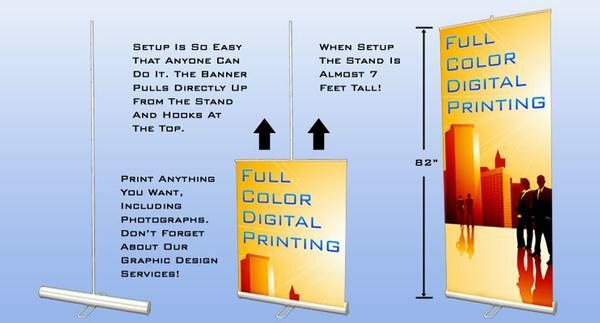 When we say “custom” full color digitally printed banners, we really mean it. We print anything you want, so you’re not limited by size, number of colors, etc. Your choice of finishing options and coating finish too. Posters are is a Pigment / Dye / QuickDry - Photo Quality Glossy material. Somewhat delicate, not scuff resistant or waterproof. Also Available: Fabric Banners, Table Covers, Table Top Displays, Vehicle Magnets, Outdoor Flags, Yard Signs, Mounted Canvas.